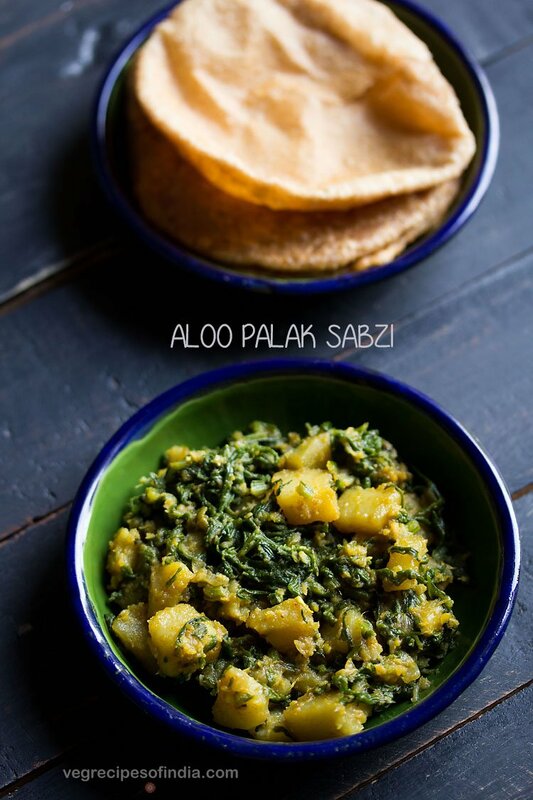 aloo palak sabzi recipe - homely style dry potato spinach dish that goes very well as a side dish with rotis, chapatis or pooris. dry aloo palak sabzi recipe with step by step pics. 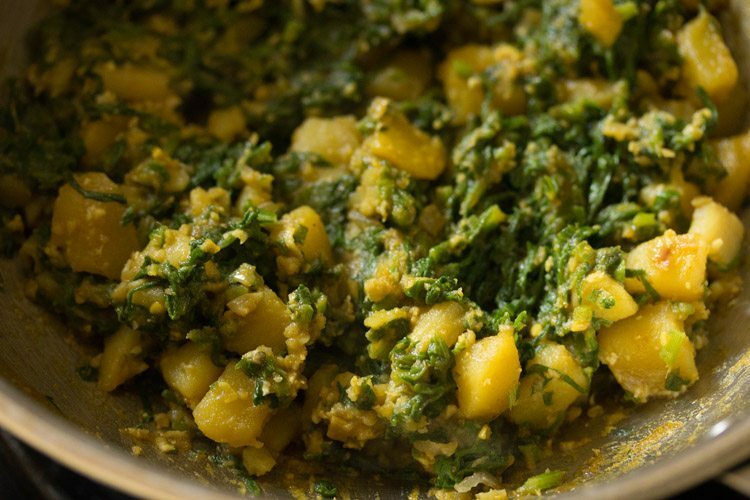 homely style dry potato spinach dish that goes very well as a side dish with rotis, chapatis or pooris. 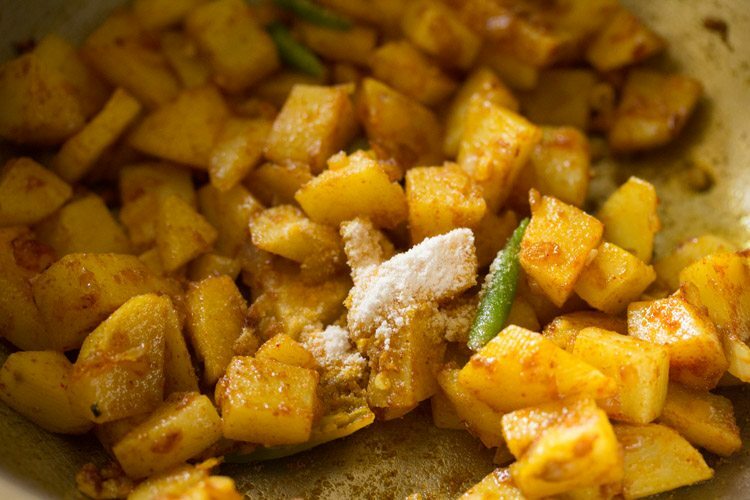 the best part of sabzis or these dry vegetable preparations are that they get done quickly. 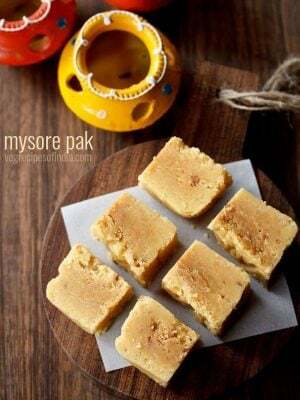 they can also be packed as tiffin box. 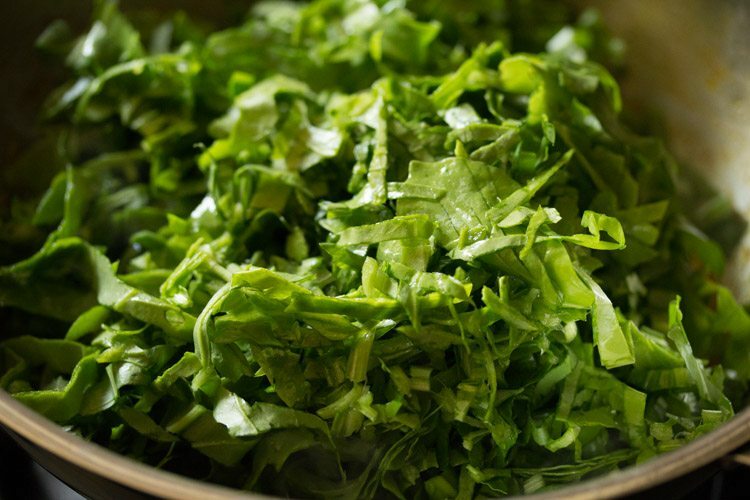 usually when making recipe with green leafy vegetables for tiffin box, its always better to pluck the leaves and keep them in the fridge. then in the morning, just rinse and chop the leaves. this helps when making tiffin recipes with greens like amaranth, methi (fenugreek leaves), spinach etc. 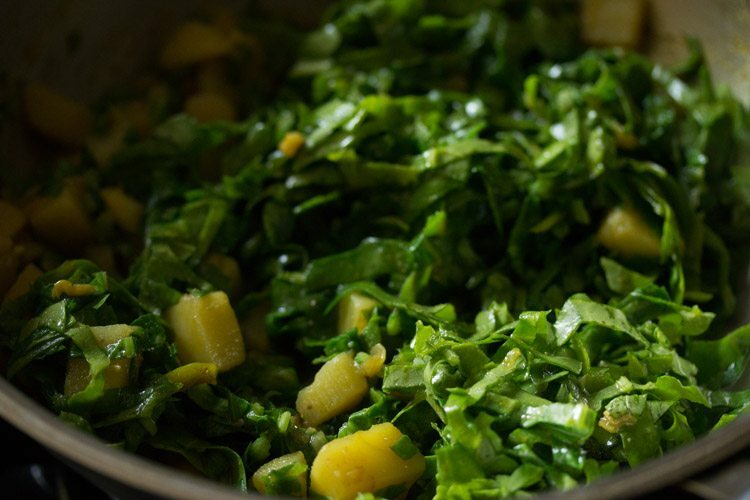 serve aloo palak sabzi as a side dish with chapatis or pooris. 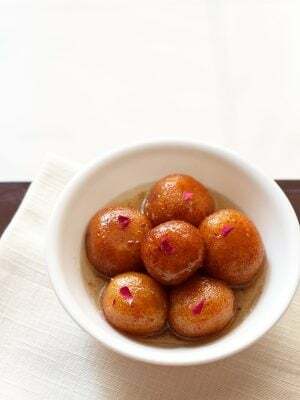 you can also serve with dal-rice or with any indian meal. 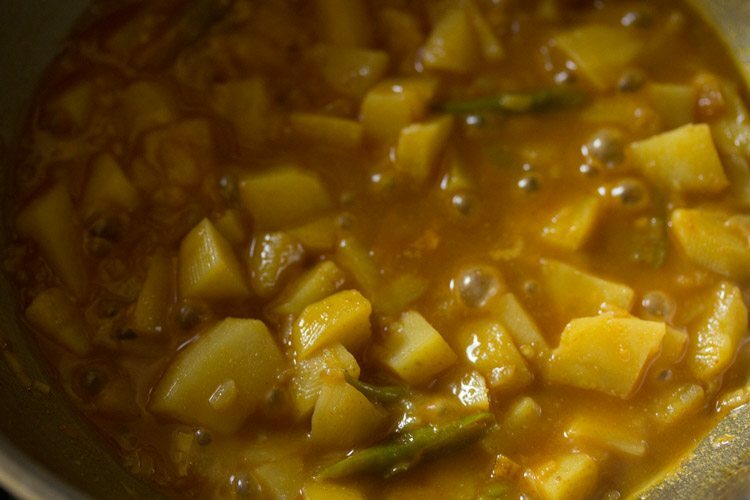 if you want to make gravy version then you can check this aloo palak curry recipe. rinse spinach leaves very well in water. finely chop them and keep aside. 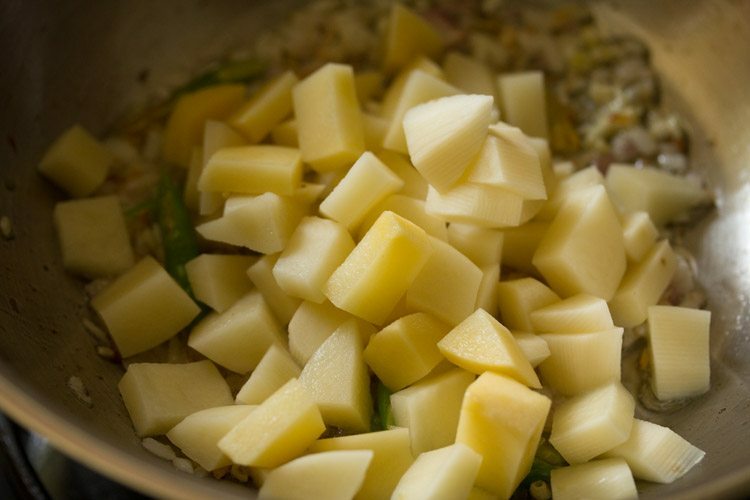 rinse, peel and chop potatoes in small cubes. finely chop 1 medium onion. also slit or slice 2 to 3 green chilies. heat 2 tablespoons oil in a pan. add ⅓ cup chopped onions. mix well. saute onions till they turn translucent. then add 2 to 3 green chilies (sliced or slit) and ½ teaspoon finely chopped garlic. 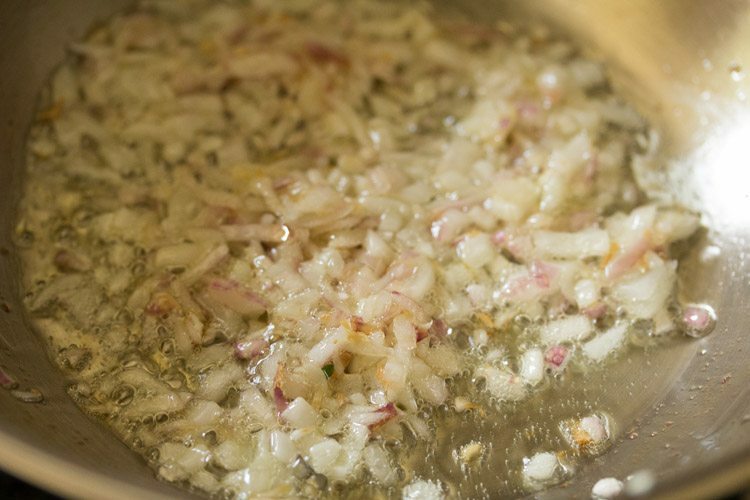 mix well and sauté for some seconds till raw aroma of garlic goes away. you can even lightly brown garlic if you want. add 1.25 cups chopped potatoes. 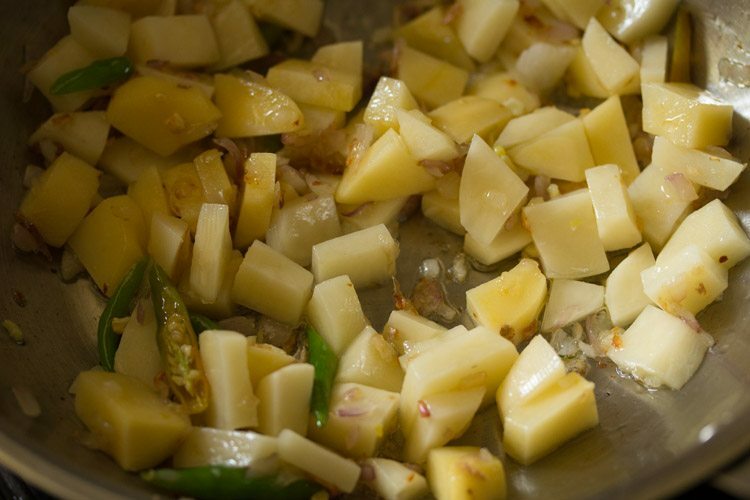 make sure to chop the potatoes in small cubes, so that they cook faster. then add ¼ teaspoon turmeric powder, ¼ teaspoon kashmiri red chili powder, ½ teaspoon coriander powder and ½ teaspoon cumin powder. mix again. add ½ cup water. mix well. cover the pan with a lid and on a low to medium-low flame cook the potatoes till they are almost done. do check when the potatoes are cooking. 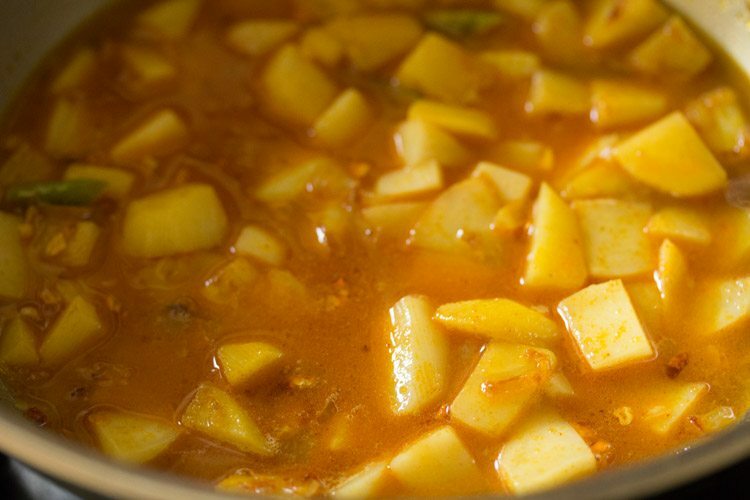 in case the water dries up and the potatoes are not cooked, then you can add some more water. simmer and cook till the potatoes are almost done. now add 3 cups finely chopped spinach. mix the spinach very well and saute till the leaves wilt. spinach gets cooked faster. stir at intervals and saute till the spinach leaves wilts and are done. add 3 tablespoons fresh grated coconut. 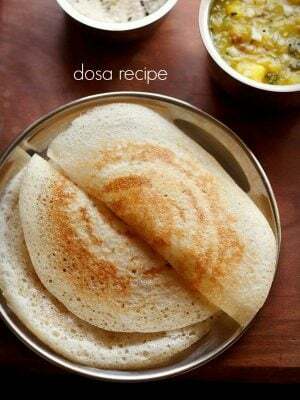 you can also use desiccated coconut. add ¼ teaspoon garam masala powder. serve dry aloo palak with chapatis or pooris. 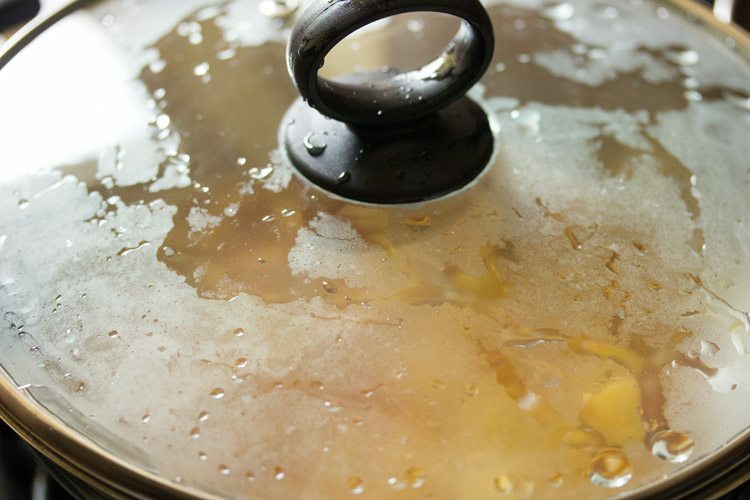 1. heat 2 tablespoons oil in a pan. add ⅓ cup chopped onions. mix well. 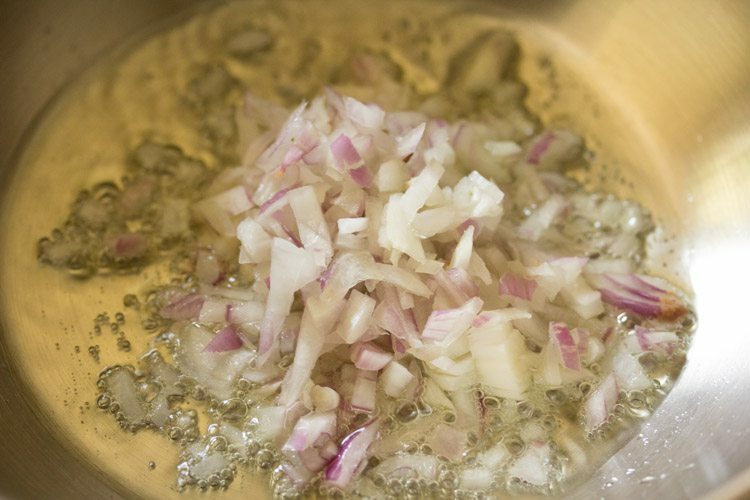 2. sauté onions till they turn translucent. 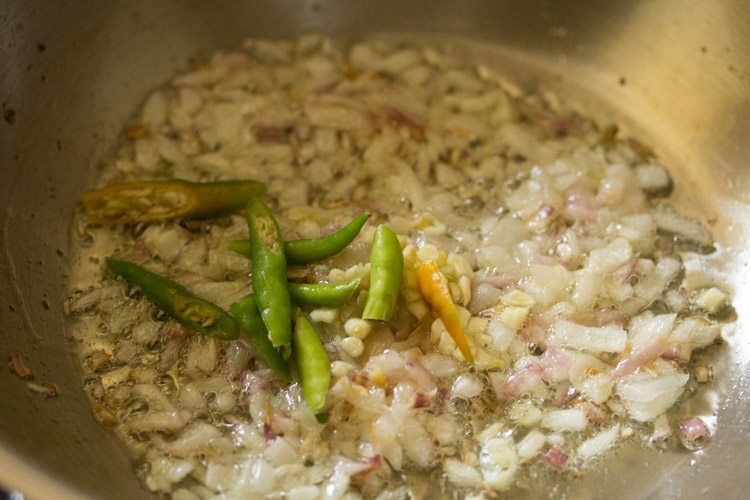 3. then add 2 to 3 green chilies (sliced or slit) and ½ teaspoon finely chopped garlic. mix well and sauté for some seconds till raw aroma of garlic goes away. you can even lightly brown garlic if you want. 4. add 1.25 cups chopped potatoes. 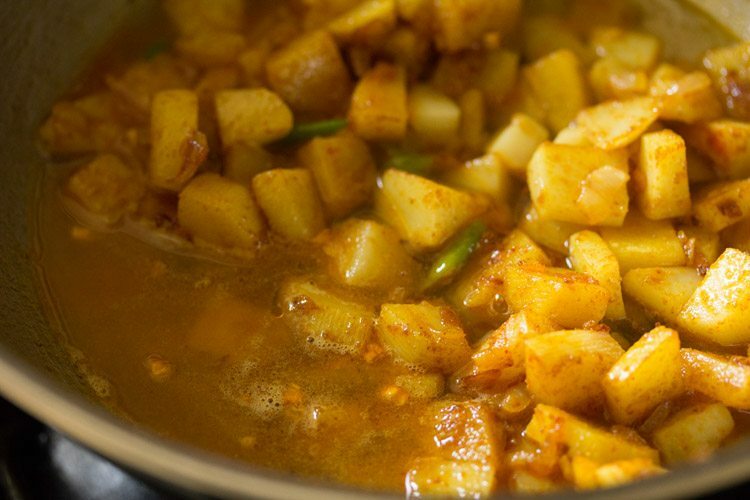 make sure to chop the potatoes in small cubes, so that they cook faster. 6. then add ¼ teaspoon turmeric powder, ¼ teaspoon kashmiri red chili powder, ½ teaspoon coriander powder and ½ teaspoon cumin powder. mix again. 7. add salt as required. 8. add ½ cup water. 10. cover the pan with a lid and on a low to medium-low flame cook the potatoes till they are almost done. do check when the potatoes are cooking. in case the water dries up and the potatoes are not cooked, then you can add some more water. 11. simmer and cook till the potatoes are almost done. 12. now add 3 cups finely chopped spinach. 13. mix the spinach very well and saute till the leaves wilt. spinach gets cooked faster. 14. stir at intervals and saute till the spinach leaves wilt and are cooked. 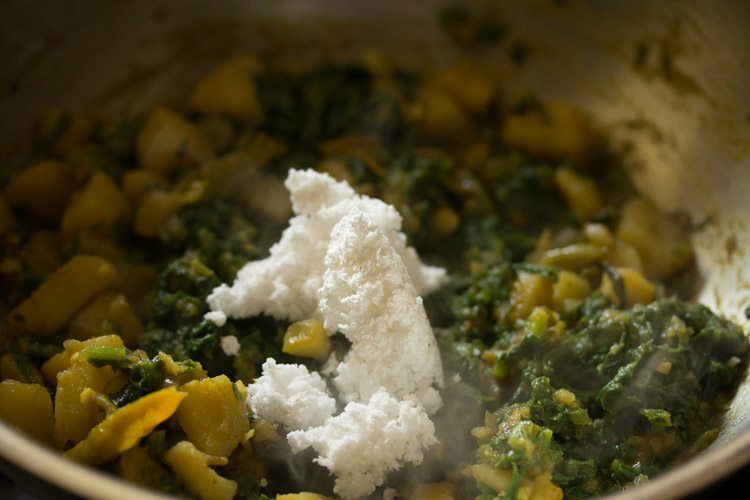 15. add 3 tablespoons fresh grated coconut. you can also use desiccated coconut. 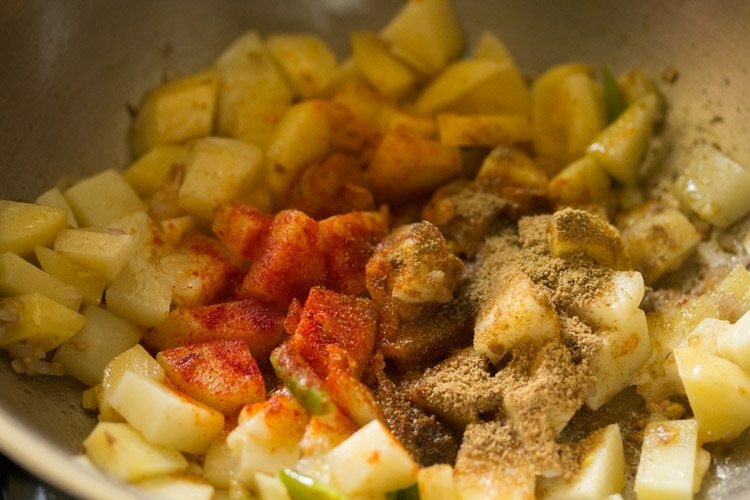 16. add ¼ teaspoon garam masala powder. 17. mix very well and switch off the flame. 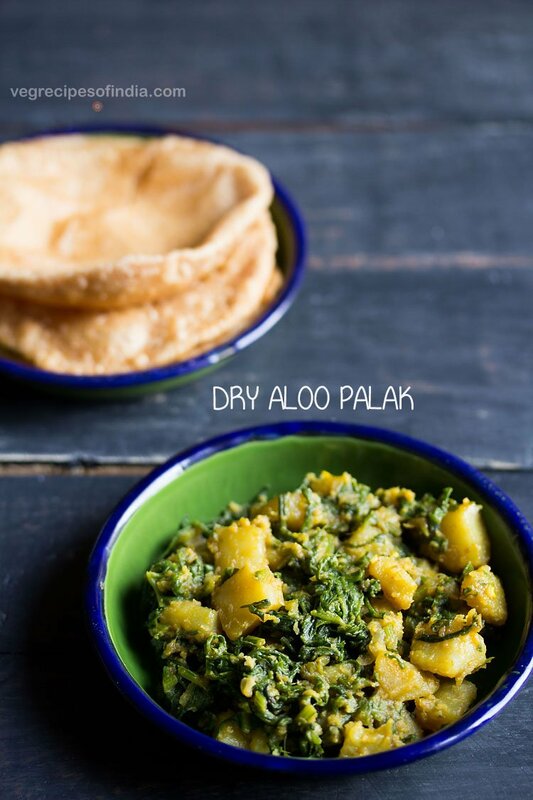 18. serve dry aloo palak with chapatis or pooris. Loved the recipe.. different from the way others cook it, so different taste and different texture. Your recipes are always very dependable and authentic, well researched..I always check out your version as a final reference whenever try anything new or even old, for that matter. Especially love your Kashmiri recipes though I’m a vegetarian and therefore my range is limited.Thank you Dassana. thank you sunita. it feels good reading your comment. i do develop and test recipes a couple of times or even more times before adding them on the website. i do not want anyone’s effort, ingredients, time etc going waste. i do try my best to give tips wherever possible so that the final dish turns out good. 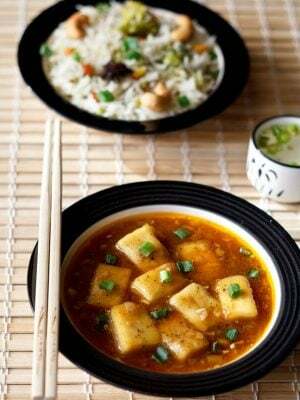 kashmiri food is a favorite of mine too, but like you being a vegetarian i have limited option in this cuisine too. most welcome sunita and thanks again. Don’t know how to thank you. This website taught me cooking when I didn’t knew much about it. You explain recipies with such simplicity that even a layman can become expert in cooking. Keep posting more delicious recepies like this. Kudos! thanks a lot pradip 🙏. 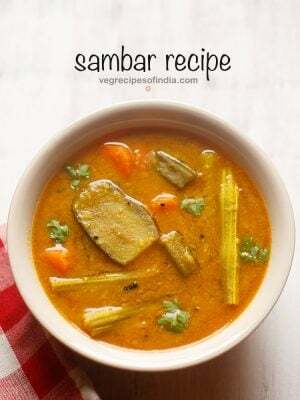 i am glad that the recipes have helped you to cook delicious indian veg food. making the recipes easy to follow is what i always strive for and i try to give as many details as possible. there are still some recipes that i need to work upon and am gradually doing it. thanks again and happy cooking. Whenever i m in confused state about cooking.. I always refer to your recipies.. Really good and tasty… Easy to make.. Very helpful.. Thank you so much for sharing this with us. welcome vrushali and thanks for this lovely comment. happy cooking. You have garlic as one of the ingredients, but after that it is not mentioned anywhere else. Should I add it after the onion gets sautéed, before I add in the chillies? I am a huge garlic lover, so I want to add it. yes you can add garlic after the onions gets sautéed. in the pics, i have added garlic along with the green chilies and then sautéed both together. thanks for letting me know. i will update in the palak sabzi recipe post. thank you mani. happy cooking and wish you all the best. rose, you can use 15 to 17 medium sized potatoes and 1 to 1.25 kg spinach. I made this tonight as a last-minute side dish–it ended up being even tastier than the main dish I spent an hour preparing. Thank you for your recipes, they’re always delicious. Welcome Fioncella. 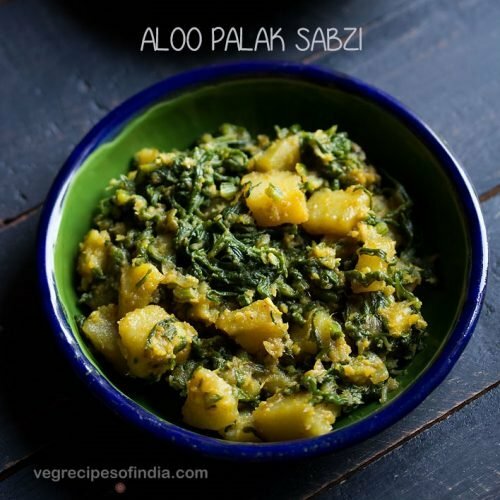 Nice to know that you liked this aloo palak sabzi. 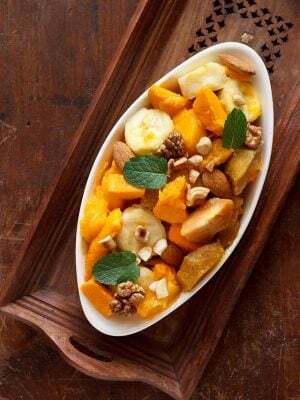 Its tasty as well as healthy side dish. Thank you so much as I plan my all meals from your website. a)If this dish is without onion will it work ? Thanks,you really give-in your best learn a lot from you. megha, thats nice to know megha. yes you can skip onions but then add a pinch of hing (asafoetida) when you add green chilies, just to mimic the flavors of onions. Delicious! Thank you so much for your easy to follow and tasty recipes! 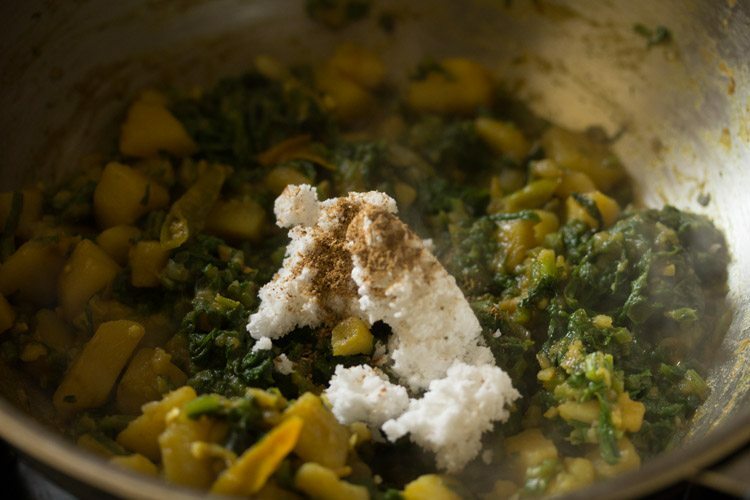 First time for me to see aloo palak sabzi with coconuts – and it turned delicious! So simple and yet elegant. 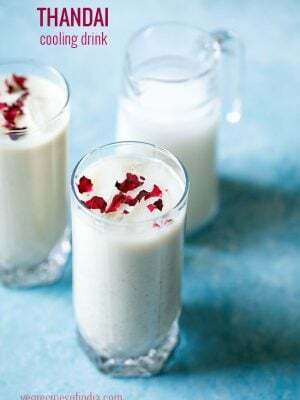 Could I ask you whether this is a Gujarati recipe? thanks for the feedback. i have no idea if this is a gujarati recipe. this is how i prepare aloo palak sabzi at home. Thanks Sayanti for sharing your positive feedback. U r my favourite author. Whenever I search recipes ur recipes ll pop out first. Thanks Subha for your kind words. thanks swetha. i don’t think its an odd combination. in fact its a delicious combination. we also have chana masala, kadala, aloo methi and some more dry veggie dishes with dosa.